TS Ambedkar Overseas Vidya Nidhi Scholarship 2018 for SC,ST and Minority students -Applications at telanganaepass.cgg.gov.in , ts ambedkar overseas vidya nidhi scholarship scheme,ts foreign education scheme,telangana overseas study schemefor sc/st/minority students,last date for apply , Overseas Scholarship Selection for SC, ST and MINORITY Services, TS Overseas Scholarship Selection for SC, ST and MINORITY Services, TS Ambedkar Overseas Vidya Nidhi scheme Scholarship,TS Foreign Education Scheme, Telangana Overseas Study Scheme,TS Ambedkar Overseas Vidya Nidhi Scheme, Financial Assistance for SC/ST/Minority Students for Pursing Higher studies Abroad. 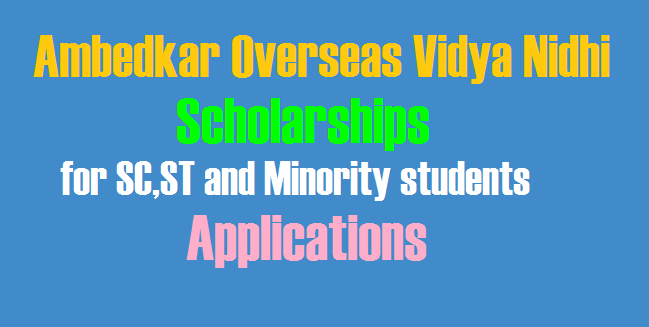 Government of Telangana State ,Social Welfare Department/Tribal Welfare Department/Minority Welfare department has published the Ambedkar Overseas Vidya Nidhi Scholarship notification and online applications are invited for grant ofRs.20.00 lakhs as financial assistance to SC/ST/Minority students who are desirous of pursuing higher studies in professional courses like Medicine/ Engineering/ Pharmacy/ Nursing/ pure Sciences/ Humanities/Social studies, etc. in Foreign Universities. The government is providing financial assistance of Rs 20 lakh in the form of scholarships to the Scheduled Caste/ST/Minority students through Ambedkar Overseas Vidya Nidhi Pathakam. The government is providing financial assistance of Rs 20 lakh in the form of scholarships to the Scheduled Caste /ST /Minority students through Ambedkar Overseas Vidya Nidhi PathakamChief Minister's Overseas Scholarship Scheme for Minorities. Registrations for Chief Minister's Overseas Scholarship Scheme are open. Last date for Registration is (see date below). The government is providing financial assistance of Rs 20 lakh in the form of scholarships to the Scheduled Caste /ST /Minority students through Ambedkar Overseas Vidya Nidhi Pathakam. Interested and eligible candidates can apply at http://telanganaepass.cgg.gov.in on or before 31/07/2018. Students whose parental income is below Rs 5 lakh per annum from all sources and who are below 35 years as on July 1 are eligible.Candidate should have secured 60 per cent of marks. Only one person per family is eligible under this scheme. Interested and eligible candidates can apply at http://telanganaepass.cgg.gov.in on or An interview for registered candidates would be held on July 7 at 9 am at the office of the Director, Masab Tank, DSS Bhavan, 3rd floor. Students should attend with their original documents for verification by the State Level Screening committee. Students whose parental income is below Rs 5.00 lakh per annum from all sources and who are below 35 years as on July 1 are eligible. Candidate should have secured 60 per cent of marks. Only one person per family is eligible under this scheme. For ST Students: Interested and eligible candidates can apply at http://telanganaepass.cgg.gov.in on or before 31-08-2018. Students whose parental income is below Rs 5 lakh per annum from all sources and who are below 35 years as on July 1 are eligible.Candidate should have secured 60 percent of marks. Only one person per family is eligible under this scheme. 1. SC Students whose family income is less than Rs.5.00 lakhs per annum from all sources are eligible. Total income from all sources of the employed candidates or his/her parents/guardians, shall not exceed Rs.5.00 lakhs per annum. In case of employees, salary certificate from the employer is a must. In all cases the income certificate must be obtained through MEE SEVA. A copy of the latest Tax Assessment as well as the latest monthly salary slip from the employer is also required to be enclosed with the application. 1. Interested students shall apply in http://telanganaepass.cgg.gov.in/OverseasLinks.jsp in prescribed format along with documents. 1. Interested students shall apply in http://telanganaepass.cgg.gov.in/OverseasLinks.jsp on or before 31-08-2018 in prescribed format along with documents.